T here is an old saying that your line has to be in the water, as in your fishing line. You can't catch a fish if you aren't fishing. Oh, do you really think a fish would just jump out of the water and into the net? Well, we all know that doesn't happen in real life and it didn't happen in scripture either; remember, the disciples still had to go fishing! They had to get into the boat, sail away from the shore and drop their nets off the right side of the boat. The beauty of the story is that they were finally following the direction of the Lord and not their own direction! (Jn. 21:6). 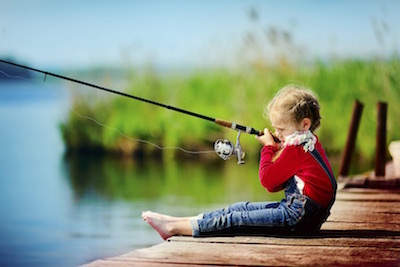 There are two teaching points here: First, be fishing! Second, listen to what Divine Intent is doing in your life. Many people connect with me frustrated that things are not happening in their life; opportunities are not coming their way. They confirm that they pray, hope and dream, but nothing materializes. Well sure, it is in the Lord's hands, but He also uses your hands. Trust is important, but never meant to be used as an excuse to remain stagnant. There is a great note in a sermon from Augustine, "The one who created you will not save you without you!" (Augustine, Sermo 169). One must take action in the light of the call to serve. As part of my own journey, it came to me that we are inspired in reflection, but not confirmed until we take action; until we put our net in the water. The key to readiness is not just preparation to fulfill the call we have waiting for us, it is also showing up and staying active. It is in keeping the Intent, not only in our heart and mind, but also in the things we do each day. There is a line that I re-language as this: "You have to see them to serve them." Love is not just shown by telling someone you love them; it is also about demonstrating that love in everything you do even when the one you love does things you don't like. Someone ready to lead is already leading; someone who is ready to serve is already serving and it goes on and on. You see, a readiness person is one who is saying YES already. The "No" person does not get it. "No, I can't do that!" or "No, I don't have time to do that!" or "No, I have never done that before and I wouldn't know where to start." It is the "YES" person who is always ready to start and ready to accept. It is the "YES" person who discovers the path of their life and the great opportunities that await them in their readiness. "Cast your bread on the surface of the waters, for you will find it after many days" Ecclesiastes 11:1 (NAS). Thom helps us understand the difference between the value of what something is and what something does.